Heat oven to 350°F. Grease 1 1/2-quart casserole. Place potatoes in 4-quart Dutch oven; add enough water (salted if desired) to cover. Cover and heat to boiling; reduce heat. Simmer about 10 minutes or until potatoes are tender; drain. Shake potatoes in Dutch oven over low heat to dry. In large bowl, mash potatoes until no lumps remain. Add milk in small amounts, beating after each addition (amount of milk needed to make potatoes smooth and fluffy depends on kind of potatoes used). Add sour cream, margarine, rosemary and salt. Beat vigorously until potatoes are light and fluffy. Stir in Havarti cheese. Spoon into casserole. Sprinkle with Cheddar cheese. Bake uncovered 30 to 35 minutes or until hot. Sprinkle with parsley. 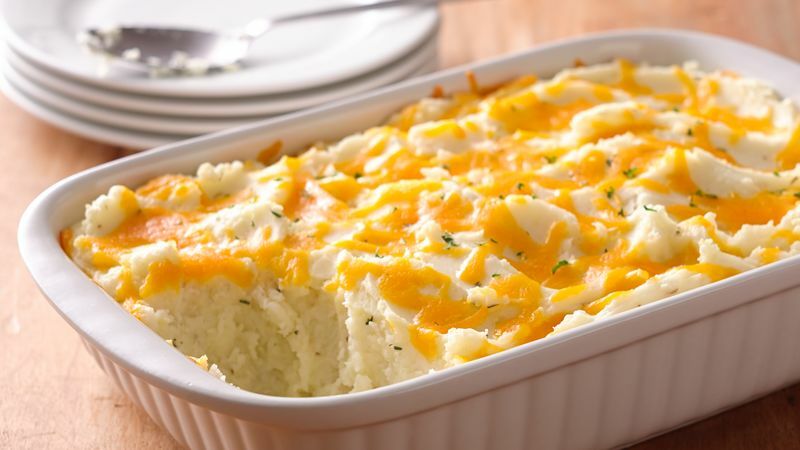 To make ahead of time, cover unbaked mashed potato mixture tightly with foil and refrigerate no longer than 24 hours. Uncover and bake 40 to 50 minutes. This recipe is great to double for those hearty appetites! Cook the potatoes in Dutch oven. Use 3-quart casserole and bake uncovered 35 to 40 minutes. If you make it ahead and refrigerate, bake 40 to 50 minutes. When you’re searching for the perfect side to go along with your comfort food, look no further than this cozy recipe. With the two types of cheese and hint of rosemary, this is not your average mashed potato casserole. And yet, this recipe is easy enough for novice cooks to prepare, and not so prescriptive that seasoned chefs can’t make this recipe their own. Remember no matter how experienced you are, you can always explore Betty’s best tips for making mashed potatoes and test your skills on one of Betty’s many other mashed potato recipes.